Make dough as directed on pouch for drop cookies. Stir in chocolate chunks, almonds and orange peel. Divide dough in half; shape each half into a roll, 8 inches long and 2 inches in diameter. Roll in sugar. Wrap dough logs tightly with plastic. Refrigerate about 2 hours or until very firm. Heat oven to 375°F. Unwrap 1 of the dough logs; cut into 1/2-inch slices. Place 2 inches apart on ungreased cookie sheets, reshaping if necessary. Repeat with remaining dough log. Bake 8 to 10 minutes or until edges are set. Cool 2 minutes; remove from cookie sheet to cooling rack. Cool completely, about 1 1/2 hours or until chocolate is set. Store covered in airtight container. 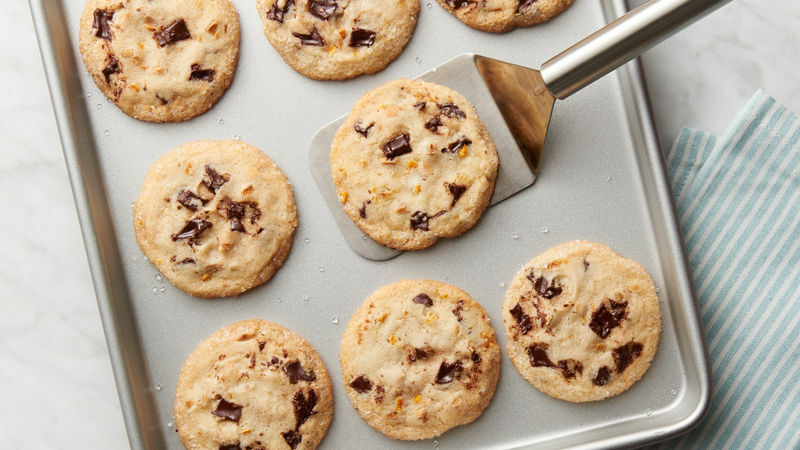 Reshape cookie dough after cutting slices for a rounder shaped cookie. To toast slivered almonds, heat oven to 350°F. Spread almonds in ungreased shallow pan. Bake 5 to 8 minutes, stirring occasionally, until light brown.